The last half of the 19th Century brought a revolution in brewing, when technical and scientific advances — including refrigeration and isolation of pure yeast strains — propelled lager beer far beyond its traditional birthplace in central Europe and allowed it to be brewed virtually anywhere. It has now reached the point where more than 90% of the beers brewed worldwide are lagers. Of course, most of us homebrewers and many craft brewers keep alive the even older tradition of ale brewing, which has had a small resurgence of its own in the past 20 years. 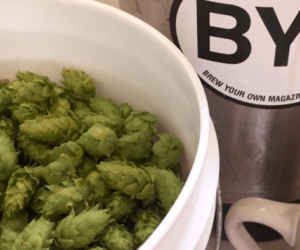 Even so, there are times when we want to brew lagers, especially the more full-flavored styles that often are harder to find commercially or are prohibitively expensive. Beginning homebrewers are often cautioned to start with ales, which are usually less demanding in terms of equipment and technique. Specifically, the requirement of maintaining fermentation temperatures around 45–55 °F (7–13 °C) — lower than typical room temperature, but higher than refrigerator temperatures — keeps many homebrewers from taking the plunge. The early cautioning can, however, lead to the notion that lagers are so difficult to brew that only the most advanced brewers should attempt them. In reality, this is far from the truth. If you like the clean quality of lager styles, there is no reason not to begin brewing them. The base malt for pale European lagers is often Pilsner malt, while American lagers using adjuncts such as corn and rice may benefit from the higher protein content and enzyme levels in pale malt from six-row barley varieties. Munich and Vienna malts contribute increased malty aromas and flavors, while the contribution of other specialty malts is much the same as in ales. A wide range of European and American malts that are malted with lager brewing in mind are available to homebrewers in North America. Extract brewers also have choices specific to lager brewing. Some malt extracts available are manufactured from malts better suited to ale brewing. However, extracts from German maltsters Weyermann and Bierkeller are available in the US. In addition, the US maltster Briess makes a Pilsen extract and homebrew retailer Beer, Beer and More Beer offers a malt extract made from German malt (Durst Pilsner). Adjuncts used in many American Pilsners and generic international lagers require mashing. Extract brewers can use rice syrup and corn syrup that are widely available, so these adjuncts can be added in the brewpot. Another option is to perform a partial mash, augmenting the mashed grains with additional light malt extract added to the boil in order to achieve the target original specific gravity. When an extract brewer is adapting an all-grain recipe that calls for Vienna or Munich malt, partial mashing is an excellent option that will allow the flavors of the grain to prosper. Mashing does not need to be appreciably different for lagers than for ales, apart from the fact that non-flaked adjuncts such as corn or rice may require a separate cereal mash to gelatinize the starches prior to being added to the main mash of base and specialty malts. The saccharification temperature of the mash largely controls the degree of attenuation and the resulting body of the beer. Choose a higher temperature rest (156–158 °F/69–70 °C) for sweeter, fuller-bodied beers, or a lower temperature (148–150 °F/64–65 °C) for drier, less full beer styles. A few lager styles, such as Czech Pilsner, feature noticeable hop character. Most lagers, however, use hops more in a supporting role, either balancing malty flavors for German styles or the light body and restrained flavors of American lagers. Consult the style guidelines for the qualities appropriate for your beer. Hop varieties used are often noble European types or their American derivatives, but it’s worth experimenting to see what may suit your tastes. The most important factor in lager brewing is the yeast. Lager strains have evolved to become adapted to lower fermentation temperatures, typically 45–55 °F (7–13 °C), which results in slower activity and more neutral flavor profiles with fewer fruity esters. There are some differences in attenuation and flavor among lager strains (some finish more dry and crisp, while others are a little more sweet and malty) but they tend to be more similar to each other than the wide diversity of ale strains. With liquid lager yeast, making a starter is all but mandatory. The claims of a yeast package being truly “pitchable” may apply to ale strains with very fresh yeast and low to moderate original specific gravity (1.050 or below), but pitching rates for lagers are far more critical. A very general rule of thumb for brewing lagers is to double everything involving the yeast when compared to ale brewing. This applies to both the quantity of yeast required and the time required to ferment the beer to completion. If you have not made a yeast starter before, instructions are available on the web sites of the major yeast suppliers, as well as in the article, “Making a Yeast Starter,” in the January-February 2006 issue of BYO. For 5 gallons (19 L) of a moderate gravity lager, a starter size of 3 quarts (2.8 L) is about the minimum. Larger volumes are recommended for larger batch sizes and bigger beers. This may mean stepping up the original starter a second time with fresh wort. Ferment the starter at room temperature; the purpose of a starter is to propagate yeast rather than produce beer. Allow 2–3 days for each step of the starter to work. If you are concerned about the flavor of the starter being different from that of the wort into which it is pitched, wait an extra day or so for the yeast to flocculate and settle out. Then pour off much of the liquid and pitch mostly the yeast sediment that remains. Two companies (Fermentis and Brewferm) have recently introduced dried lager yeast strains. For many homebrewers, the verdict is still out on dried lager yeast, but some homebrewers report good results with these new strains. Lager yeast benefits greatly from wort aeration. Consider investing in an oxygenation or aeration system. (For further information see the Advanced Brewing column in the December 2005 issue). At the very least, pour the chilled wort back and forth several times between sanitized buckets from a height of 3 feet (~1 m) or more in order to increase the level of dissolved oxygen. Additional aeration can be provided after pitching the yeast, up to the point where there is noticeable fermentation activity. Wort chilling is also more important in lager brewing. The wort should be chilled to a temperature of 60 °F (15 °C) or below. If you use an immersion or counterflow wort chiller, the temperature of the chilling water becomes a factor. Those who have relatively warm tap water may have to employ an ice-water bath pre-chiller for the water or post-chiller for the wort. Obviously, controlling the fermentation temperature is also important. Unless you are fortunate enough to have a location with a stable temperature of 45–55 °F (7–13 °C), this will require a fermentation chamber of some sort. Most homebrewers of lagers use a spare refrigerator or freezer with an external temperature controller to ferment their beer, which allows quite precise control (within 2 °F/1 °C). Used refrigerators and freezers are easy to find; the controllers are available from homebrew shops or electrical and heating/air conditioning wholesalers. Some lager yeast strains produce sulfur compounds — particularly hydrogen sulfide (H2S) — during fermentation, resulting in somewhat unpleasant odors that are disturbing to the unsuspecting. Don’t be too concerned about these, although you may wish to inform others with whom you share your living space. With time and proper conditioning, these will dissipate and disappear entirely from the finished beer. Another source of confusion for inexperienced lager brewers is the so-called diacetyl rest. Some lager yeast strains are known for their production of diacetyl (2,3 butanedione), a chemical compound often described as being like butter or butterscotch. Diacetyl has a very low flavor and aroma threshold, about 200 parts per billion (ppb) for most people. In very small amounts it can contribute a buttery smoothness, but it quickly gets out of hand. In most lager styles diacetyl is considered a flaw. Fortunately, brewer’s yeast is capable of reabsorbing the diacetyl and reducing it to a related compound (2,3 butanediol) that has a far lower flavor threshold. However, this requires warmer temperatures, around 60–70 °F (16–21 °C, than the optimum conditions for clean lager fermentation. The solution is to raise the temperature for a brief period (24–72 hours) after the yeast has nearly finished fermenting the beer. For homebrewers this typically means letting the fermenter warm to room temperature for a couple of days. Not all lager strains produce significant amounts of diacetyl, but unless you have previous experience with the yeast you are using, it is best to perform the rest anyway, as it does no harm. Conduct the rest in the primary fermenter in order to maximize the yeast population and quickly reduce the diacetyl. Once fermentation and the diacetyl rest have been completed, it is time to rack to a secondary fermenter and lager the beer. The term “lagering” refers to the extended secondary aging the beer undergoes at cold temperatures (hovering above freezing). Removed from the primary yeast sediment and allowed to chill and age, the beer should clear and sulfury and other various extraneous aromas and flavors dissipate until it achieves that clean character for which lagers are known. As the saying goes, time heals many wounds. A number of the haze problems sometimes associated with ales are conspicuously absent from most lagers, mainly due to the time spent lagering. Some brewing texts recommend slowly reducing the temperature by no more than 5 °F (3 °C) per day until the temperature is at the desired setting for lagering. However, many homebrewers ignore this advice and achieve excellent results. There is agreement that in order to achieve the maximum effect the lagering needs to be done cold, with the temperature no more than 40 °F (5 °C). Many commercial breweries lager at nearly freezing temperatures, in the 32–34 °F (0–1 °C) range. After its long, cold slumber, the beer should be clear, clean and ready for bottling or kegging. At this point it can be racked from the secondary fermenter or lagering vessel to a serving keg or bottling bucket. It’s best to keep the beer relatively cold while doing so to minimize foaming. Homebrewers may wonder if there is still enough healthy yeast remaining to carbonate the beer. In terms of numbers, the answer is usually yes. Even seemingly crystal clear unfiltered beer contains a considerable amount of yeast. However, it may not be as healthy as desired, especially in higher gravity beers. Those who wish to hedge their bets may want to pitch additional yeast at bottling. I recommend this if the original gravity is 1.070 or higher. The bottling yeast does not have to be a lager strain. The purpose of the additional yeast is merely to ferment the priming sugar and produce carbonation. A good neutral ale strain will do a fine job and dried yeast is very convenient for this purpose. If the beer is naturally carbonated, allow the bottles or kegs to warm to room temperature for at least three weeks. Sample the beer to ensure the carbonation is at or near the desired level. High gravity lagers benefit from additional conditioning in the bottle, but others can be served as soon as they are carbonated. Refrigeration of lagers is recommended but not required for long-term storage; at a minimum avoid warm temperatures and wide fluctuations in order to promote stability and to retard staling. Take the leap into lagering? Once you clear the main hurdle — finding a spot to maintain lager fermentation temperatures — brewing a lager is not significantly harder to brew than an ale. At that point, the leap to lagering is more of a hop.